What is Voices for Protection? 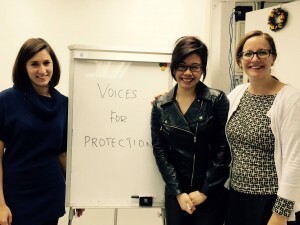 Launched around World Refugee Day in 2014, Voices for Protection is an innovative programme to empower people seeking protection with the skills, platform and information about Hong Kong to realise their rights and become change-makers in the community. The programme fosters self-confidence, leadership and community organization skills to build a collective voice with the goal of creating an inclusive Hong Kong society. It includes a 12-week refugee rights and advocacy traineeship where refugees can receive interactive instruction about advocacy, human rights, campaigning and community organization with input from several guest speakers. The course is tailored to the specific needs of the group and the changing political climate in Hong Kong. Since launching the programme, more than 50 refugee men and women from over a dozen countries have graduated from three intakes of the traineeship. What is advocacy and what tools can we use to effect change? What are human rights and how do we defend them? How to protect one’s security when engaging in public advocacy and media work? How to communicate your message effectively to different audiences? What are the policies and laws around refugees in Hong Kong? Who are the key decision-makers that hold power? Filing a submission to the UN Committee on the Elimination of Discrimination against Women and to LegCo panel meetings. Speaking to community groups, universities and schools on refugee issues and engaging in media work, such as interviews with journalists, speaking on the radio and guest-blogging. The Social Justice Alliance was born out of the opportunity to learn brought on by the Voices for Protection Programme at Justice Centre. All of the men and women in the Social Justice Alliance are graduates of Voices for Protection. After the completion of the programme, graduates gathered to discuss future opportunities for advocacy. The Social Justice Alliance developed out of the vision of enjoying equal rights and opportunities, integrating and contributing to a good relationship between refugees and the Hong Kong community. The fourth intake of Voices of Protection will be a special session aimed at gender empowerment of refugee women. Through the generous support of HER Fund, this intake provides a space for women to talk openly about gender in the context of human rights, Hong Kong politics and society and life as a refugee. Women are in a unique position to engage in advocacy and enact change in their community. The intake will provide opportunities for refugee women to interact with the leaders of other women’s groups and grassroots coalitions in Hong Kong. Voices for Protection WOMEN will empower women with the skills and tools they need to bring about a positive change in their community and a transformative change in themselves. Applications for Voices for Protection WOMEN are now closed. Please contact Betsey at betsey@justicecentre.org.hk if you are a protection claimant who is interested in the Voices for Protection programme or if you would like to learn about ways that you can provide support.